This article was written By John Berra on 18 Aug 2011, and is filed under Reviews. A widely-used term in studies of the social changes that have occurred in China over the past two decades is ‘floating population’, a reference to the increasing number of migrant workers who lack household registration status. Until the early 1980s, government migration policy was particularly strict, thereby restricting most workers to their home province. Since then, regulations have gradually relaxed, allowing labourers to move around the country to search for steady jobs. Although the rapid urban development of the 1980s necessitated revisions of migration policy in order to ensure the sufficient number of workers needed to sustain the construction boom, it was in the mid-1990s that this ‘floating population’ became a fully-fledged demographic. This was due to the simplification of the recruitment process in 1994 so that migrant workers could obtain temporary positions – mostly in the building sector or service industries – by showing their ID cards to prospective employers, whereas official stamped letters were previously required. Migrant workers have served as protagonists for independent filmmakers seeking to explore the social fabric of the People’s Republic, hence their presence in Li Yang’s Blind Shaft (2003) and Jia Zhangke’s Still Life (2006). They have also been the focus of such documentaries as Xiaolu Guo’s The Concrete Revolution (2004), Zhao Dayong’s Street Life (2008) and Last Train Home, a heart-breaking portrait of familial disconnection through migration by Chinese-Canadian director Linxin Fan. As with other documentarians who have covered the subject, Fan considers the human consequences of China’s economic miracle. The documentary follows three years in the lives of the Zhang family, a unit that is struggling to maintain its value system in an accelerated society due to a sense of abandonment. Hard-working parents Changhua Zhang and Suqin Chen decided to become migrant workers sixteen years ago, joining the estimated ‘floating population’ of 130 million people in order to provide their children with a proper education and a hopeful future. Leaving their son Yang and daughter Qin in the care of their grandparents, Changha and Suqin left their native Sichuan province to undertake factory positions in the city of Guangzhou in Guangdong Province, only returning home once every twelve months to celebrate the New Year holiday. The film opens with this annual journey, as Changhua and Suqin desperately attempt to obtain train tickets, a waiting game that often forces workers to stand for days under the supervision of military troops. On arrival home, it becomes apparent that 17-year-old Qin has little regard for the expectations of her parents, having only spent a few days each year in their company since she was born. Qin states that she wants to drop out of school and swap her rural surroundings for the city by also becoming a migrant worker; although her parents try their best to persuade Qin to stay in school, they are ultimately unsuccessful. Qin’s attitude eventually leads to a verbally heated argument with her father that descends into physical violence when Changhua is provoked by his daughter’s use of foul language. 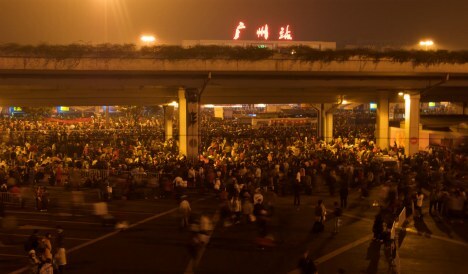 Last Train Home begins as a documentary about the difficulties of getting back to family at the busiest time of the year, with looming overhead shots of the crowd around Guangzhou station followed by footage captured at the centre of the thronging mass. However, while the immediate problem of securing train tickets can be dealt with through sheer tenacity, the situation which awaits Changhua and Suqin at home is less easily resolved. Fan was one of the producers of Yung Chang’s Up the Yangtze (2008), which dealt with displacement in the region of Fengdu, and Last Train Home also contrasts the natural beauty of China’s landscape with the pain that has been caused by economic progress. Once the migrants have managed to board the train, Fan shows a series of spectacular vistas that are often snow-covered due to heavy storms at the time of filming, while the Zhang’s home province has a simple beauty that suggests a well-earned respite from the gloomy factory floors of Guangzhou. Yet there is a domestic storm brewing in the form of Qin’s teenage rebellion and it is possible that younger child Yang may follow in her resentful footsteps, despite currently being fifth in his class at school. As with the best documentarians, Fan keeps a distance throughout, although there is a moment when Qin addresses the camera in a fit of anger that heightens the level of engagement through direct confrontation. Sacrifice has turned these parents into strangers, and Last Train Home should be praised for soberly addressing this point without resorting to social polemic. 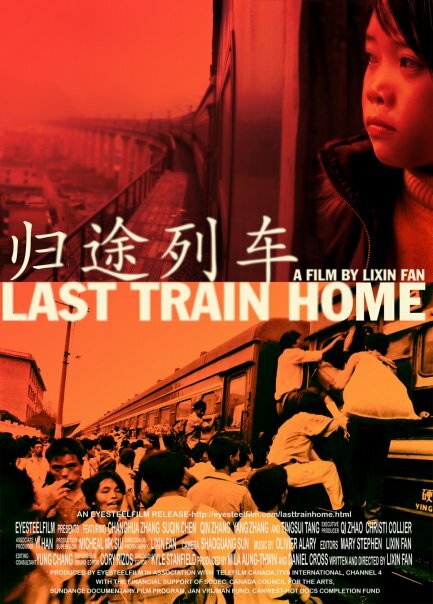 Last Train Home is distributed in the UK by Dogwoof, one of many independent distributors that will struggle in the coming months due to the loss of stock in the riot-related fire at the Pias/Sony warehouse in Enfield. Please consider supporting these companies by ordering some of their titles for your collection, or as gifts for friends and family members. DVDs can be purchased from Amazon, HMV, Play and other online retailers. Also, many of these companies have titles available for legal download via iTunes or Mubi. As DVD stock will understandably run low over the next month, please look into these alternative avenues for checking out their films.